Incredible place in a quiet neighborhood. The sea is right below your feet when you are sitting on the terrace. Alessandro, the owner, is a perfect host - he is ready to answer your questions and solve any possible problems around the clock. We've already stayed at his place two times and are going to visit him the next year, as well. I would definitely recommend this place. Sehr netter und unkomplizierter Vermieter. Ruhige Lage. (bei Anreise mit dem Auto - Navi nicht vergessen!). Sehr gepflegte Wohnung (Bad etwas zu klein für 4 Personen), Haus mit 3 Parteien, Parkmöglichkeit direkt vor der Tür. Fantastischer Meerblick (180°) von der großen Terrasse. Direkter Meerzugang ein echtes Plus. superbe séjour, location très agréable et confortable. accueil chaleureux et propriétaire a l'écoute et attentif a notre bien être. Séjour très agréable au bord de la mer dans un environnement très calme et propice aux vacances. L'appartement en duplex est très bien equip? et la terrasse est vraiment conforme à la photo du site internet. La baignade a partir des rochers, dans une eau transparente est un bonheur. Accueil chaleureux par le proprietaire Alessandro en prime ! Amazing villa with seaview and a splendid terrace overlooking Taormina to Acitrezza. Unique location for a perfect holiday enjoying silence, nature and a splendid seaview. 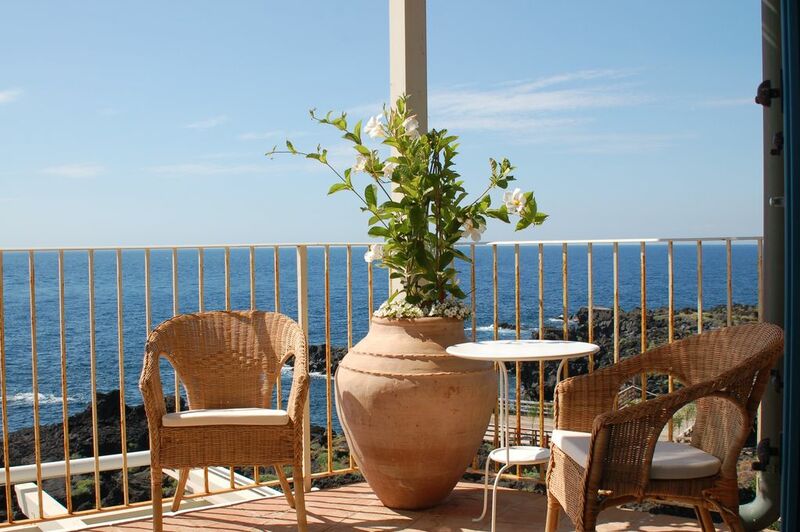 The villa is located directly on a private road that goes down to the sea, among lava rocks and capers, with an easy stairway and a boardwalk. The house is 20 minutes away from Catania and Taormina and 10 minutes away from the motorway to Syracuse and Piazza Armerina. Moreover, it is few kilometres away from many sandy or pebble beaches. We have boats for short trips on the Ionian Coast and scuba diving, but we also have some off-road vehicles for trips to Mount Etna or the Sicilian countryside, among citrus trees, vegetables and infinite lawns. This beautiful newly built house is decorated with the typical Sicilian style, sleeps 4+3, has classy furniture and hosts the great collection of modern artworks “mare rosso e blu”. Golf: The house is few kilometres away from Picciolo Golf Club Etna.